This engraving shows the Maya site of Palenque, and is one of the earliest published images of ancient Maya architecture. It shows the temple as half-ruined and abandoned. The sculpted reliefs on the front façade still exist, but the stairs and plastered based of the pyramid are crumbling. Vegetation sprouts from cracks in the temple, and, as an imaginative addition, two Maya lounge near their companions, under the shade of a tree. The large lithograph, which measures 25 3/4" x 21" (65.5 x 53.5 cm), has been folded to fit into the smaller folio volume. It depicts the Temple of the Inscriptions, an 8th-century funerary pyramid of the Maya lord Pacal. The draughtsman, Luciano Castañeda, was able to see the remains of the plaster narrative scenes that decorated the building, and he faithfully recorded them in his drawing. Tiny human figures at the lower edge of the stairs appear dressed in breechclouts and holding spears. These Maya, although dressed in clothes quite different from those worn by Maya of the region in the early 19th-century, reinforce both the looming scale of the temple and the exotic qualities of the scene. Guillermo Dupaix, a captain in Spanish army, was commissioned by the crown government of Charles IV to document the “antiquities” of New Spain (as ancient works of art and architecture were called). Accompanied by a Mexican illustrator, Luciano Castañeda, Dupaix traveled extensively between 1805 and1808. At many sites he did first-hand investigation, searching out new finds. 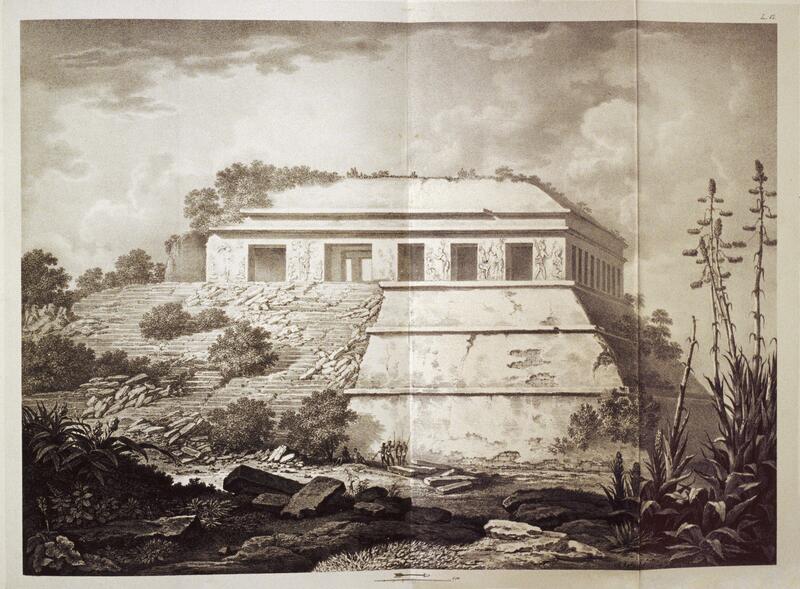 This engraving was based on one of Casteñeda’s many drawings of sites across Mexico. These illustrations were published between 1830-48 as part of the nine-volume Antiquities of Mexico by Lord Kingsborough. Kingsborough brought together reproductions of 16th century Nahua manuscripts along with drawings of far more ancient architecture and sculpture created by the Maya and Zapotec. This pan-cultural history was not understood to be such, as all these works were subsumed under the rubric of “Mexican antiquities.” Nonetheless, given that the Spanish crown tightly restricted travel by Europeans in New Spain and its other American colonies, the rare published accounts of the colonies, like this one and those of Alexander von Humboldt and Antonio de Ulloa, were revelatory to a European public. Dupaix’s expedition can be understood as a manifestation of a wider European interest in ruins as the material remains of lost civilizations. Beyond this, in a Mexico on the verge of its own independence movement, the discovery and celebration of these ruins confirmed that the continent had its own long history and added ideological heft to the move to independence. Alcina Franch, José, ed. 1969. Guillermo Dupaix. Expediciones acerca de los antiguos monumentos de la Nueva Espana, 1805-1808. Madrid: Ediciones J. Porrua Turanzas. Estrada de Gerlero, Elena I. 1993. "Carlos III y los estudios anticuarios en Nueva Espana." In 1492-1992. V centenario: Arte y historia. Xavier Moyssen and Louise Noelle, eds. Pp. 63-92. Mexico: Universidad Nacional Autonoma de Mexico. Estrada de Gerlero, Elena I. 1994. “La labor anticuaria novohispana en la época de Carlos IV; Guillermo Dupaix, precursor de la historia del arte prehispanico.” In Arte, historia e identidad en América: visiones comparativas. Gustavo Curiel et al., eds. 1:191-205. Mexico: Universidad Nacional Autonoma de Mexico. Kingsborough, Edward King. 1830-48. Antiquities of Mexico: comprising fac-similes of ancient Mexican paintings and hieroglyphics, preserved in the royal libraries of Paris, Berlin and Dresden, in the Imperial library of Vienna, in the Vatican library, in the Borgian museum at Rome, in the library of the Institute at Bologna, and in the Bodleian library at Oxford. Together with the Monuments of New Spain, by M. Dupaix: with their respective scales of measurement and accompanying descriptions. The whole illustrated by many valuable inedited manuscripts, by Augustine Aglio. London: A. Aglio. Pillsbury, Joanne, ed. 2012. 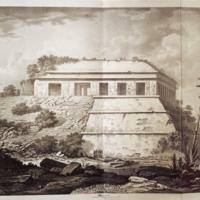 Past Presented: Archaeological Illustration and the Ancient Americas. Washington, D.C.: Dumbarton Oaks Research Library and Collection.